← Happy Birthday President Washington! I titled this a Nod to the Dreamers because two books exhibit particularly creative approaches to poetry and one chronicles the roots and meaning of a well-known song. Poets are nothing if not dreamers. 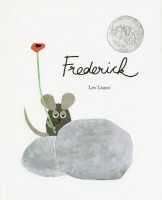 Frederick, written and illustrated by Leo Lionni. Pantheon Books, a division of Random House, New York, 1967. When the little field mice begin storing supplies away for the winter, Frederick seems to be too lazy to help. “Frederick, why don’t you work?” they ask. “I do work…I gather sun rays for the cold dark winter days.” And so, as the other mice work feverishly to prepare for winter, Frederick gathers colors—and words. When winter finally comes and their supplies are running low, the field mice turn to Frederick for the gift only a poet can give. Lionni’s illustrations will appeal to the youngest child, but the message will resonate with readers of all ages who were ever accused of being too much of a dreamer. Writers and poets will recognize themselves in Frederick and rejoice when his mice friends credit him for the gift only he could give. I own the Pinwheel paperback edition of Frederick. 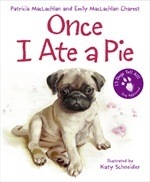 It is dog-eared and well worn—proof of how many times I read it to both of my children. Every time I re-read it, I’m reminded of the little girl who gazed out the window of her elementary school, day-dreaming, instead of paying attention to the task at hand. This story will validate every budding poet and writer who, more often than not, feels as if their “gift” is a poor substitute for being the best mathematician or scientist in the class. This one is for poets and dreamers of any age. The pages on which the familiar chorus is sung has intricate, detailed pictures children will love to pore over. 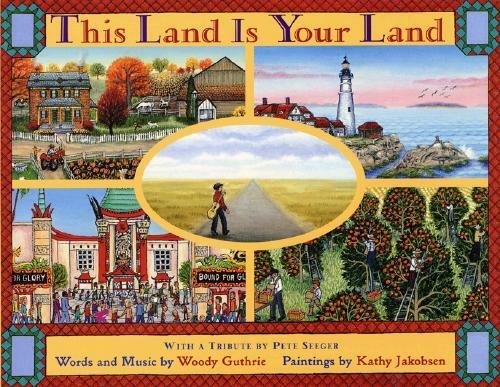 The first chorus is accompanied by a full page painting of San FranciscoBay. The facing page—New York City with twin towers intact.